Sooner or later, almost everybody gets locked out of the house. You may think that getting locked out of the house won't happen to you, but just you wait. If you don't take preventative measures against getting locked out, it could very well happen when you least expect it. Yes, you could break the glass on your patio door, or drag a ladder from the shed to climb into a second story bedroom. Been there, done that. But there are better options! Should you leave a door or window unlocked as protection against getting locked out? Of course not! Because if you know how to break into your house, a burglar can easily discover that method, too. Always lock your doors and windows. 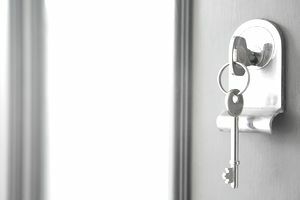 The secret to avoid getting locked out of the house is to make an extra set of keys, and make sure you have access to a spare key in the event you are locked out. If you do not have an extra key, you may need to call a locksmith. Just in case, program a locksmith's phone number into your cellphone. Be prepared to prove you own the home when the locksmith shows up. Start by making sure that all the locks in your home are keyed to one key. You can remove your door knobs and take them to a hardware store, do it yourself (if you know how) or call a locksmith to change all the locks so they unlock with the same key. A locksmith is your easiest but most costly solution. Give an extra key to a friend, family member or neighbor whom you trust. My housekeeper has a key to my house, so does the pet sitter. Buy a fake rock, put the key inside and hide the rock in the garden. Make sure the rock looks real because burglars know how to look for these. Not everybody agrees this is a good idea. Carry an extra key in a briefcase or, if you're a woman, your bag. Install a wireless keypad on the outside of your garage and hide a key inside the garage. Bear in mind that in the event of a power failure, your garage door may not open. Make sure you have a battery backup. Lock the key inside your electrical panel and lock the panel with a combination padlock. Put the combination into your cellphone so you don't accidentally forget the code. Attach a heavy duty contractor's box to a gas pipe and put the key inside. It is best to hide the contractor's box so it is not in plain sight. Under the mat. First place people look, not to mention, a strong wind might blow it off the steps. In the mailbox (this is definitely where crooks first look). In your car's glove box. Remember that anyone else who lives with you should also know exactly how to get into the house, and how to avoid the need to smash a window! Be sure you've communicated the location of extra keys to everyone who needs to know.